The award-winning Truro Residence, by ZeroEnergy Design received a Citation for Sustainability from the Boston Society of Architects. March 24, 2010 - PRLog -- ZeroEnergy Design, the architecture firm that designed the Truro Residence, accepted a Citation for Sustainability from the Boston Society of Architects, for the Small Firms/Small Projects Design Awards. 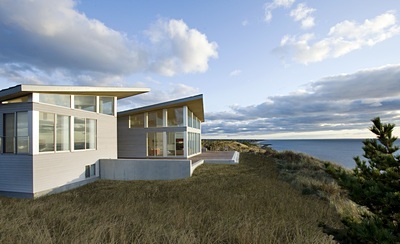 The Truro Residence is a modern, oceanfront vacation home perched 115’ above sea level overlooking Cape Cod Bay. The home features native landscaping throughout the 1.7 acre site and near zero energy use thanks to a high performance building envelope, a geothermal heating and cooling system, and photovoltaic panels that produce nearly as much energy as the home uses each year. The BSA Small Firms/Small Projects Design Awards are judged by a panel of industry professionals. Co-sponsored by the BSA Small Firms Committee, the BSA Residential Design Committee and the Congress of Residential Architects, the sole judging criterion of this award program is design excellence. ZeroEnergy Design, an architecture and mechanical engineering firm, designs high performance residences for new construction and renovation. The unique collaboration between in-house architects, mechanical engineers, and financial analysts enables the firm to deliver fully integrated design services. Silvia & Silvia is a custom building firm located on Cape Cod, Mass. that specializes in custom building, new construction, renovations, cabinetry and property management. Silvia & Silvia’s appreciation of Old World craftsmanship combined with innovative 21st century construction practices create distinctive, elegant, and energy-efficient homes in the seaside villages and towns of Cape Cod.